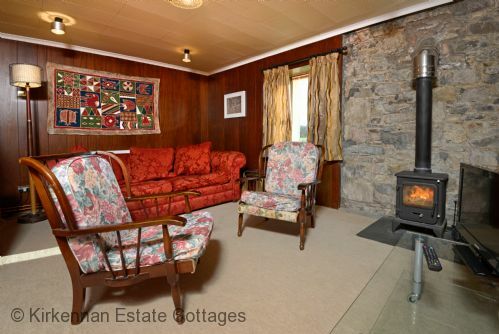 Comfortable cottage on the peaceful Kirkennan Estate. Sleeps 4 & 1. Dogs welcome. Absolutely beautiful in every way, lovely cottage, stunning views, fabulous walks and a very warm welcome. We will definitely be back in the near future! The birds and animals you can see without going out are a treat, the red squirels the most entertaining. Autum colours of the specimen trees were at their best (Oct 1st) Ten mins to the shops, fifteen and you can walk on a beach of clam shells. Walking and cycle routes are great. Cosy cottage in very quiet location, just the place to recharge your batteries. Everything provided that you would want in the cottage and quiet places to walk with the dogs in safety. Plenty of wildlife to keep you amused..
We really enjoyed the peace and tranquility of Kirkennan. A second visit for one of the party so hope to come again.The Mewsis spacious well equipped and comfortable. The estate is well placed for country pursuits and in easy reach of coastal destinations. Spacious cottage in a lovely location. Enjoyed seeing the many types of birds and wildlife. Helpful friendly neighbour as well! Another great stay at Kirkennan Mews! 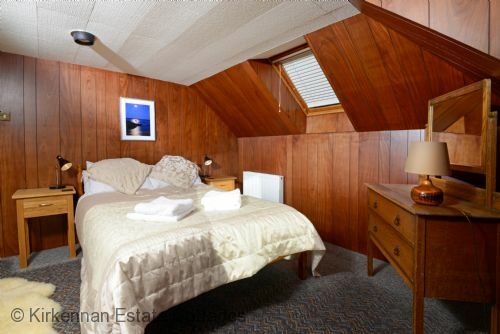 A clean & well equipped accommodation in a stunning location. So relaxing watching, red squirrels, rabbits, deer & lots of different birds on the front lawn every day. Our dogs loved running free in Jock’s Wood behind the cottage. 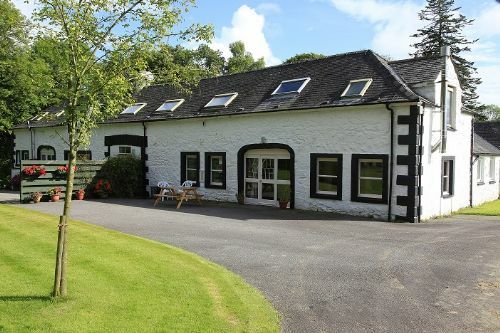 A fantastic base to explore the wonderful Dumfries & Galloway area including the Solway coast. We would definitely recommend this to anyone & will be back!! Brilliant find for a short break with a pup and two teenagers. The Mews is so cosy and the wildlife is outstanding-just outside the front window. The private walks were great and the night sky on a clear night is amazing. 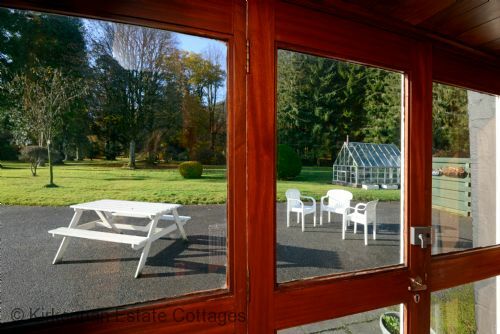 Very good mix of seclusion and proximity to Dalbeattie for ample amenities. The fresh eggs on arrival were a lovely touch. We hope to return to this gem of a place. We have stayed a few times and absolutely love Kirkennan it is set in such beautiful surroundings. Jenny and Micheal are so welcoming and helpful and always bring a gift of home grown produce which is lovely. We have a lovely relaxed break at kirkennan which is what we are after we can enjoy watching the red squirrels frolicking and all the amazing bird life it’s got all we need and more. Thanks for taking the time to leave a review. We love having repeat guests like you who love Kirkennan as much as we do. We look forward to seeing you again later in the year. Lovely place for a short break. Comfortable with plenty of room. Dog friendly but you need to take your own throws for the sofas (two large, three seater leather ones plus two chairs so pack plenty!). Dog box of old towels and toys a nice touch as was the veg and eggs for the human guests. Alfie dog loved Jocks Wood and forest on other side of road was good too. Turn off for the drive hard to spot from the road, keep your eyes peeled for Kirkennan on gate post. I am glad you enjoyed your short break at Kirkennan Jody. It sounds like Alfie had a good time. It is always a pleasure to have you and your family to stay John. We look forward to seeing you again later in the year. What a beautiful part of Scotland! Kirkennan Mews are in a wonderful position, surrounded by beautiful trees and woods. The owners are very friendly, helpful and treat you like one of the family. There was even a welcoming basket of lovely home-grown vegetables. We took our 3 dogs and although there is no garden actually attached to the Mews cottage, there is a huge enclosed wood just 20 metres from the front door where they could all run free and enjoy lots of exciting sniffs. The accommodation is very comfortable if a tad dated but there is everything you could possibly need including complementary tea, coffee etc. There are lots of interesting places to visit and some magnificent drives and coastal walks. We had an excellent holiday and thoroughly recommend Kirkennan. Thanks for recommending Kirkennan Cally. I am so glad you all had an excellent holiday. A lovely relaxing place. Perfect for exploring both in the grounds & nearby. An excellent dog friendly place, ours loved Jock's Wood & the beaches we visited. The Mews was very clean & comfortable & well equipped for self catering. We were greeted by Jenny who was very helpful & bearing fresh, home grown veggies. We saw deer, red squirrels, rabbits & various types of birds from The Mews. We thoroughly enjoyed our stay & hope to return again soon!! I am so glad you had a relaxing break at Kirkennan. We hope to welcome you back soon. A really authentic cottage within a lovely grounds. Nice walks within short distances. Lovely hosts and always happy to help if needed. Short drive to shops and restaurants. I am so pleased you enjoyed your stay at Kirkennan. I hope we see you again. 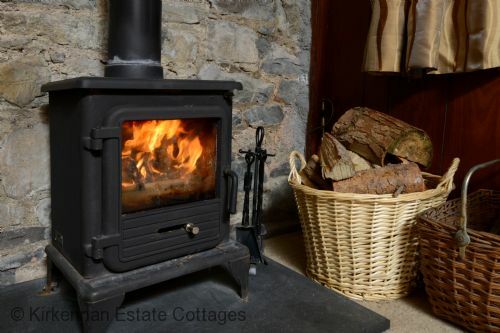 Comfortable warm and extremely well-equipped cottage on lovely country estate a few miles from Castle Douglas to the North and Dalbeattie to the South. Estate contains a walled garden, many mature trees and flowering shrubbery and a host of wildlife including, red squirrels, grouse, deer and badgers. Dogs are also made very welcome and there is a large off-lead area. Thanks for taking the time to leave a review. I am pleased you found The Mews warm, comfortable and well equipped. We stayed for three nights in the Mews with our dogs and although we were a bit concerned about the lack of garden, the 14 acres of Jocks wood on the doorstep meant it wasn't a problem. The cottage was clean and comfortable and set in stunning grounds, which you can walk around. The fresh eggs and vegetables on arrival were a lovely surprise and Jenny is the perfect host, helpful but not intrusive. Dumfries and Galloway has so much to see and do and so many dog friendly walks and beaches that you are spoilt for choice. 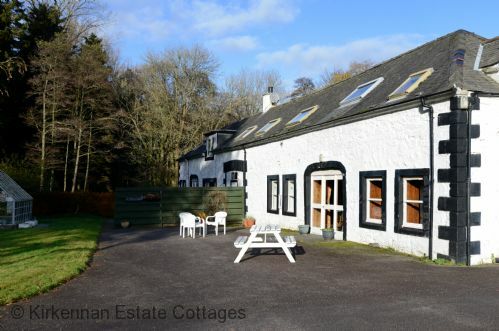 We would recommend Kilkennan as the ideal dog friendly base to explore from. I am so glad you enjoyed your stay at Kirkennan and that you found us very dog friendly. We do find dogs tend to love Jock's wood. For the benefit of any potential guests reading this, The Mews does have outside space with furniture but it is not enclosed. If you are looking for an enclosed garden please consider Woodsedge or The Lodge. Great place to stay, particularly if you have a dog. Superb setting and location. As soon as we got home we were working on holiday dates to book a return visit. The accommodation was spacious and well equipped. The estate was an absolute delight. We visit a lot of similar types of holiday accommodation and this is definitely up there with the best of them. The surrounding area offers many attractions but you may find the estate so peaceful and attractive you may opt to spend most of your time there. I am so glad you enjoyed your stay - we certainly hope to see you again at Kirkennan. This is the 4th or 5th time we've stayed at kirkennen and we have already booked again for later in the year. seems to be too much trouble and they always make you feel very welcome. We can't wait to go back. It is always a pleasure to welcome you back to Kirkennan. We look forward to seeing you again later in the year. Stayed at the mews in March. Lovely location quiet and peaceful. A great chilled break with friendly owners and Jock next door. Our dog loved his stay as did we. Definitely would return. Loved the night sky. Thanks for having us. Thanks for taking the time to leave a review. I agree Kirkennan is a lovely location and the night skies are spectacular! I do hope you will return some time. 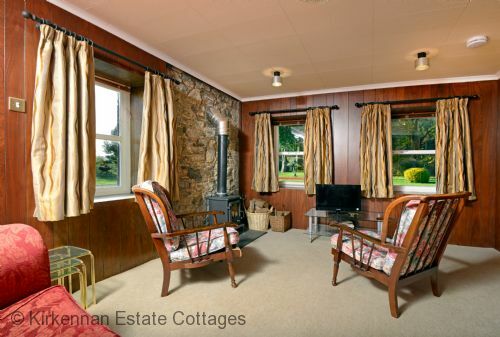 Booked this news cottage because of location(an hour from our house) dog friendly and value for money. And it didn't disappoint on all of these. Very cozy and comfy and walks around the estate and the area are great. Both Jennifer and Michael were about the grounds and chatted too. All in all a great stay and highly recommended. I am so pleased you enjoyed your stay at Kirkennan and hope that we will see you again sometime. Accommodation had everything we needed. As mentioned to us at start of our stay the log fire was slightly smokey when first lit but we coped. We appreciated the veg we were given from the garden and used it all in several stir fries. I am glad you found The Mews had all you needed. The fire is only ever smokey on days with absolutely no wind - and since your visit we have been told by another guest that the solution is to hold the door firmly shut with the insulated glove provided for a couple of minutes. Once it is warm it draws well. Superb... we can't wait to return! I am so glad you enjoyed your New Year at Kirkennan - it really is a lovely place to get together with friends. I am just sorry we are already booked for the dates when you wanted to return. Hopefully you can come some other time. I am pleased you enjoyed your Xmas at Kirkennan. The red squirrels are frequently active around Kirkennan and are such a joy to watch. I do hope to see you again at Kirkennan sometime. We spent a lovely long weekend here in December to celebrate my birthday and enjoyed our stay very much. The cottage was clean, warm and welcoming and the grounds are simply beautiful. Our only criticism was the furniture in the living room. The support has gone in the settee so once sat in it, it is quite difficult to get out of and someone before us had broken a spring in one of the chairs and had looped it through the springs in front of it, making the seat a little lacking in support. However, these were our only problem and very minor, so it won't stop us going back in the future. I am so glad you enjoyed your stay and would love to have you back again some time. I am sorry you had concerns about the furniture in the sitting room; thanks for bringing the broken chair spring to our attention. My husband has now fixed it and the chair is much firmer. We do encourage people to report any issues whilst here so we can try to sort them immediately - one of the advantages of living on site! I have checked the settee and think it is the low soft style that makes it possibly harder to get out of rather than the support having gone - I find it very comfortable, but realise it is a matter of taste; the (now repaired) armchairs are both higher and firmer so easier to get in and out of for those that prefer that. For any potential visitors who are concerned about being able to easily get in and out of arm chairs or sofas please note that we have an electric recliner/riser in Kirkennan Woodsedge for this very reason. 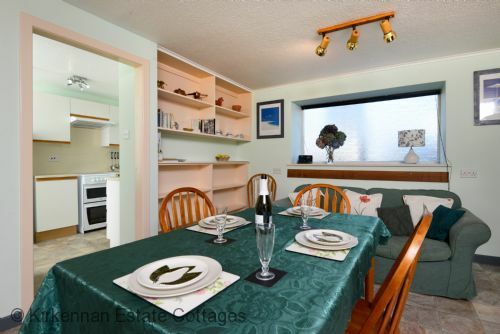 We always have a great holiday at Kirkennan and keep returning it gas everything we love it is a nice peaceful location lots of wildlife and close to many fantastic walks. We love it there. And we love having you here - it is lovely to know our guests appreciate the wildlife and local area as much as we do. Thanks for booking again for next year. I am glad you all enjoyed your stay at Kirkennan and very pleased that you have booked to come back again next year. We look forward to seeing you then. We had a lovely three-night stay in the Mews cottage on the beautiful Kirkennan Estate with our two boys and pet dog. The grounds are stunning and the enclosed Jock's Wood provided the perfect morning walk for the dog. We were lucky enough to have one clear night to look at the stars - we could see the Milky Way. The cottage was very cosy and warm, and there is a great selection of games to keep the kids amused. Lovely part of Scotland and I would highly recommend a visit - we plan to come back with extended family and try the Lodge at some point. I am very glad you enjoyed your stay at The Mews - and also enjoyed the gardens and Jock's wood. We would be very pleased to welcome you back with the extended family. Comfortable and cosy. Lovely to watch red squirrels and deer while we ate breakfast. Great place to stay with a dog. I am so glad you found The Mews comfortable and cozy. It is lovely to see the red squirrels and deer around - and they do seem to be active at the moment. We hope to see you again sometime. The Mews was warm cosy and well equipped. The views from the windows was wonderful and so was watching the wildlife. Our dog loved "Jocks Wood" and the forest across the road.The nearby beaches at Sandyhills and Rockcliffe were clean and not very busy. Dalbeatie and Castle Douglas are good for shopping. We love this area of Scotland and hope to go back soon. I am so glad you found The Mews warm, cosy and well equipped. I have to agree this is a wonderful area of Scotland - and not particularly well known, which is why the beaches are never very busy even when accessible directly from the road as with Sandyhills and Rockcliffe. Jock's wood is always a hit with our dog visitors. I think the title of this review says it all. A beautiful cottage in beautiful surroundings in a beautiful corner of Scotland. Each day we got up and said " Another day in paradise". Our 2 huskies loved the enclosed wood, as they could run around as much as they needed and wanted. Worth noting that the fence between the wood and sheep field is only approx 4 feet. Luckily my dogs were having to much fun to think about jumping it and bothering the sheep. I have to agree that Kirkennan is a wonderful place - we consider ourselves very lucky to be living here and do enjoy sharing it with others who love it as much as we do. This was our second stay at Kirkennan Mews and it was just as good as the first. There is excellent dog walking in the woods at the side of the cottage which both our dogs enjoyed especially as they were allowed off lead. 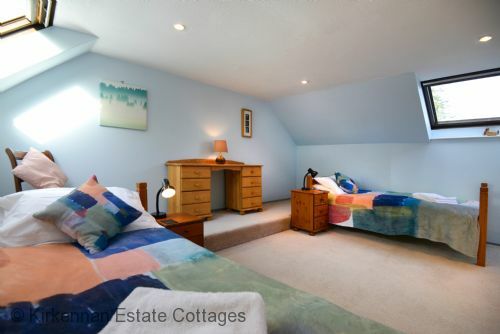 We cannot fault this cottage, it's lovely and cosy, but yet easily big enough for a family of 4 with a couple of dogs. The area is fantastic for either walking, cycling or just relaxing. I am so glad you enjoyed your second stay at Kirkennan and do look forward to welcoming you back. I am so glad you enjoyed your holiday. We look forward to welcoming you next time. The Mews is the most delightful property. The hosts made us very welcome, greeting us with eggs, tomatoes and fresh beans. The property is lovely and warm (unlike some we have stayed in),and the rooms are a lovely size. We stayed with our two dogs and there was plenty of room. We were lucky, the weather was kind, but if not, the cottage has many books, games and DVD's for amusement. We were absolutely delighted to see red squirrels playing outside the front door within 30 minutes of arrival, and the woods are ideal for walking the dogs in the morning. There we saw red deer and a tawny owl. It is lovely and peaceful, and an ideal base for exploring that area of Scotland. I would recommend this property without hesitation, once I have booked again for next year! I am so glad you enjoyed your stay at Kirkennan and found it delightful and warm and a good place to explore from. The central heating was put in last year so it is good to hear it is performing well - it runs from a district heating system biomass boiler. It sounds like you really enjoyed the wildlife - the red squirrels are very active at the moment as they get ready for winter and are a real delight to see. We look forward to welcoming you back next year. I am glad you enjoyed your holiday so much. I agree this is a lovely location. Please do come again sometime. This is a lovely place to stay, the grounds are amazing and it was a delight to watch the red squirrels. Our accommodation was very comfortable and spacious and we particularly liked the range of books, jigsaws and games on offer for those rainy days as well as the table tennis in the walled garden. The location is great for visiting the surrounding area, there were more places to visit than the time available so we would definitely like to return one day. I am glad you enjoyed your holiday. I also love watching the red squirrels, who are very active currently. Please do return sometime.